Мда, неясно что там Alexandru Dicu оптимизируют,но 150mb памяти все таки многовато по сравнению с комодовскими 18. У меня сейчас порядка 100 МБ (v3.8.2.2, Win8 x64). Это у какой версии и что за Win? Это на 7x64 c версией 3.8.2.2, правда сейчас около 135мб (wfc=87 и wfcs=48) как по мне все таки многовато как для крошечной программы. Я про версию Комодо спрашивал. Неужели это с учётом службы cmdagent? Спасибо,упустил из виду,с учётом суммарная выходит около 65мб. Для фаера столь "мелкого" класса все равно даже 100 Мб в памяти много. ИМХО. window for a connection generated by System. description of the inbound rule contains "Outbound" instead of "Inbound". mechanism of reading of the initial set of data. channel gets in faulted state, without needing to restart the program. А что же шапка умалчивала о самом важном - что этому хрену необходим .NET 4.0? Добавил. - New: Added the possibility to copy the filename in the clipboard when the user clicks on the filename in a notification. Open file location was moved to the program icon, so pressing on the program icon will open the file location folder. - New: When the user recreates the recommended rules there is no result dialog to inform the user if the action was completed or not. Now, a new confirmation is displayed. - Updated: WFC recommended rules for Windows Store in Windows 8 was updated. - Fixed: A new notification is not displayed if the Location is changed and there is a rule which blocks other Locations. For example, if a browser is allowed for Domain location only and the user switches to Public location, then the browser is blocked without displaying a new notification. - Fixed: The default rule for the WFC updater is not the correct one on a clean install, only when the user chooses to recreate WFC recommended rules from the Rules tab. - Fixed: When exporting a policy file it does not overwrite a file with the same name even if the confirmation dialog says that the new file was successfully saved. - Fixed: When importing a policy file the profile is switched to Low Filtering and the notifications are set to disabled. These two settings are left now like they were before the import. - Fixed: Update dialog result does not show in the center of the Control Panel window if Manage Rules window is opened. 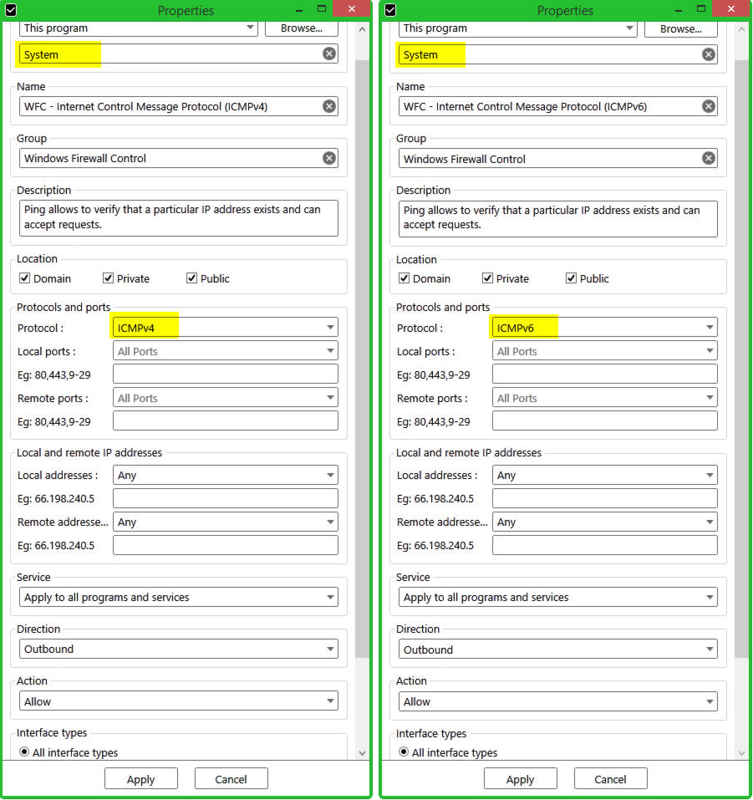 New: When creating a new rule from the Recently Blocked connections datagrid, the user can customize the rule before creating it. Just use double click on a row or the context menu. Updated: The search box text box from Manage Rules has now a clear button in it. Updated: Manage Rules datagrid supports now Ctrl+Home and Ctrl+End key combinations to quick scroll to top or bottom. Updated: The text boxes length was increased from 254 to 2048 characters. Updated: The radio buttons template was reverted from the checkbox template. Fixed: The Location is not set correctly on the duplicated rule when the user creates a duplicate rule from the context menu in Manage Rules datagrid. Removed: Due to the duplicate notifications that have been reported, the validation for the Locations was removed. - Новое: Новое контекстное меню для кнопки подтверждения "T" было добавлено в окне уведомлений, которое позволяет разрешать правило временно. Временные правила теперь поддерживают автоудаление в интервале 1 час, 5 минут или 1 минута. - Обновлено: В окне уведомления клик левой кнопкой мыши по иконке программы копирует полный путь в буфер обмена, правый клик копирует только имя файла, открывается путь программы при клике по названию. - Исправлено: Создание нового автоматического правила для окна "Recently Blocked" не работает, когда пользователь выбирает создать правило для входящих соединений в списке. · Fixed: The Installation ID can't be read if C:\ partition is not a fixed drive. This happens for example when the user has an SD card inserted during the Windows installation and the Windows partition is then D:\ drive. · Fixed: The program crashes if the user creates a rule for a program launched from a network location and the icon of the application can't be read remotely. · Updated: Windows Firewall logging remains enabled even if when the user uninstalls Windows Firewall Control. · Updated: Added new logging points in the program, useful for debugging purposes. Как эта программа ограничивает исходящие, если виндовый фаервол выпускает всех?